'Suit of Armor' bulletproof suit by Garrison Bespoke: image via garrisonbespoke.comIf attempts on your life are all in a day's work, but you still need to dress comfortably and stylishly on the job, you need a fashionable suit of armor. Garrison Bespoke has just the proprietary threads to make you a custom bulletproof suit that's elegant, stylish, and lightweight too! Nestled in downtown Toronto's financial district, Garrison Bespoke is considered by top style magazines to be Canada's best custom tailor. 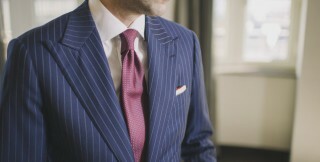 Entrepreneurs at Garrison Bespoke spent a year developing a new bulletproof thread with suppliers of the U.S. Special Forces. The resulting thread uses the latest nanotechnology, employing carbon nanotubes to produce a hard, but flexible, fabric. Garrison's fabric is about half the weight of Kevlar, the most common material used to make bulletproof garments. Military innovations are seeping more and more rapidly into civilian culture, and it's great to see this bulletproof nanofabric is one of those innovations. Perhaps more such fabrics can be made that will enable others, who don't have the financial resources for a $20,000 suit, to purchase clothing that is as protective and lightweight as Garrison's.